Right now I'm using a pair of AKG 460's with cardioid (ck61) capsules. I traded an AKG 414 for them many years ago. Now I feel bad because it's clear I got the better part of that deal (sorry Walter). We've been using the Sound Devices 702 for just about everything of late. T-Mouse rehearsals, production sound, and even classical music. 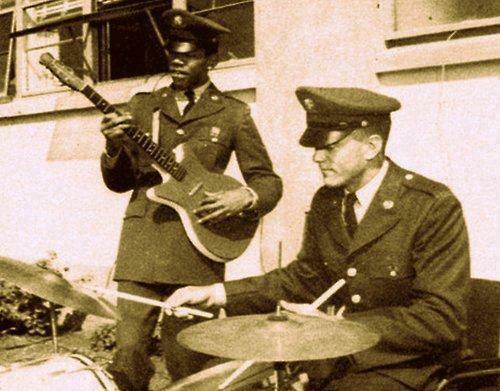 The 101st Airborne has had good guitarists in their time. This one is named James Hendrix. For nigh on 10 years now I've been the recordist for the Russian Chamber Chorus of New York. And I just recently got a note about the way I've been recording which changes the way I think about recording. The maestro, Nikolai Kachanov, prefers the "blended" sound of mics in the distance rather than (what I usually go for) the "articulated" sound which is fairly close up. So, the simple answer is to move the microphones further back. Now some problems with that include the fact that audiences are fantastically noisy. I mean... they're amazingly noisy. And with the microphones further from the chorus the audience becomes even louder (relatively) than the chorus. What I'd really like to do is be able to get a stereo pair of microphones about thirty feet in the air. Like maybe on a silent floating remote controlled helicopter. Or some sort of balloon. Or possibly using magic. I'm willing to try anything. The other major cheat I've noticed with the RCCNY is to go ahead and compress the sound. Yeah, I know, in classical music circles that's a big "no-no". But you know what? It sounds great. It makes the sound bigger and thicker and everybody loves it. Purity? Feh.